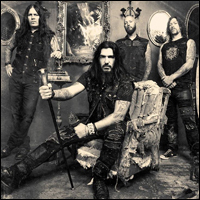 After 23 years with Dave McClain pounding the skins at the drum throne, and 15 years with Phil Demmel shredding the guitar on stage right, both members have decided to move on from Machine Head and open a new chapter in their lives. Watch Robb's emotional announcement that happened Friday on Facebook Live below. To clarify: this is the Farewell Tour of this line up of Machine Head, not the Farewell Tour of Machine Head, as has been reported in the media. Machine Head ask that you, the Head Cases, the Freaks & Zeroes, the Lion Hearts of America, come down and have a drink (or 5), a joint (or 2), rage at the shows, let your freak-flag-fly, and celebrate this unique moment in time with us. The band will once again will be giving fans "An Evening With” MACHINE HEAD, no openers, no B.S., just 2 1/2 hours of classic and new material!